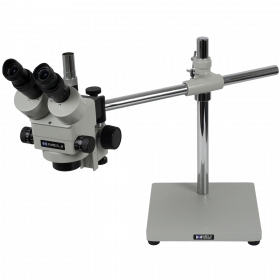 Binocular stereo microscope head with 7x - 45x zoom magnification, extended field of view, 360-degree rotation, high eye-point 45-degree eyepiece inclination, 93mm working distance and dual dioptric adjustment. The EMZ-5H stereo head is a new upgrade to the EMZ5 Meiji workhorse, bringing exceptional optical quality in a compact, ergonomic design. 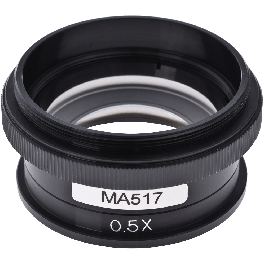 With optional MA522 10x high eye-point eyepieces, the head offers 12.7mm greater field of view than standard, zoom magnification from 7x - 45x and sharp focus throughout the zoom range. The eyetubes are set at 45-degree inclination for viewing comfort, rotate 360-degrees, and include dual dioptric adjustments. Interpupillary eye adjustment is 54mm - 75mm and working distance is 93mm. 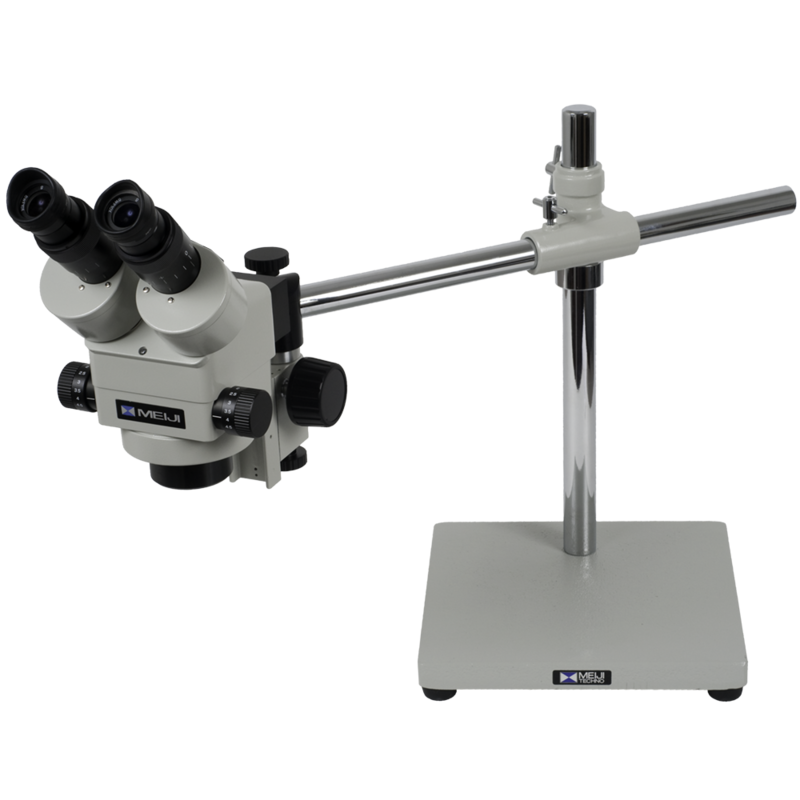 Higher magnification is available with optional eyepieces and objectives. 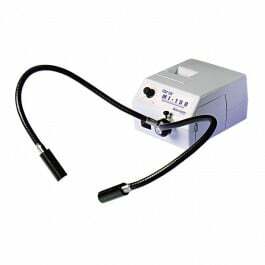 This Meiji professional fiber-optic illuminator provides 150W of powerful halogen illumination and is ideal for both industrial and laboratory applications requiring fiber-optic illumination. 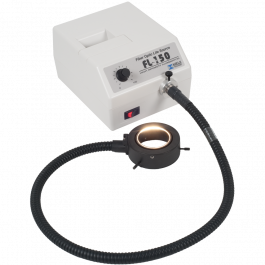 The quartz halogen light source allows a continuous range of subdued or concentrated lighting, controlled by a rotary dimmer dial on the front panel. The lamp color temperature is 3200ºK providing 40,000 foot candles of cold illumination, while forced-air cooling ensures a long lamp service life. The Annular light guide features a 36" flexible cable with 10mm dia. fiber optic bundle and a 60mm diameter ring aperture designed to fit RZ and EMZ stereo microscopes. 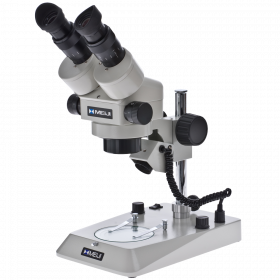 EMF series microscopes will need adapter MA553, and EMT series will need adapter MA553/05. UL-1571 and CE/CSA 2001 compliant. 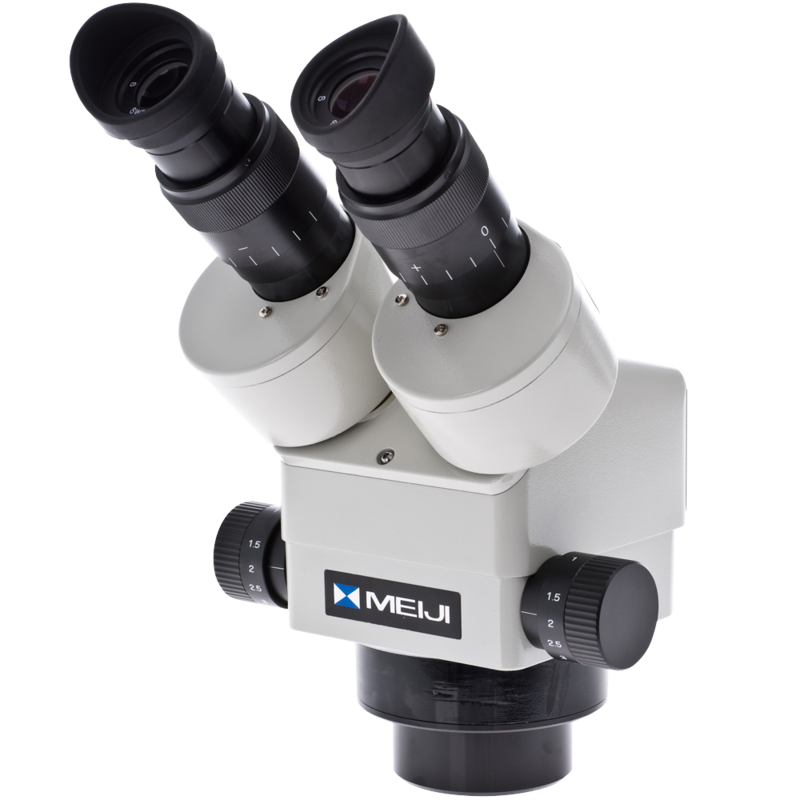 The Meiji SMD-5 stereo microscope inspection station is designed specifically for close inspection of soldering welds on circuit boards and delicate electronics repairs. 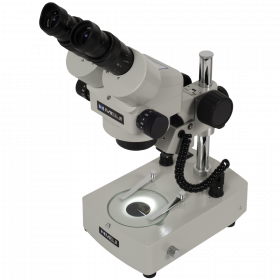 It combines Meiji's best-selling EMZ-5 zoom stereo binocular microscope body, the S-4100 boom inspection stand, MA964 LED ring illumination system and two sets (10X and 20X) of wide field eyepieces. Limited Lifetime Warranty. 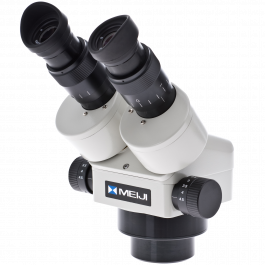 The EMZ-5 stereo binocular head is one of Meiji's most popular stereo microscope heads. It is their workhorse industrial and educational head offering good quality, an affordable price and zero defects. 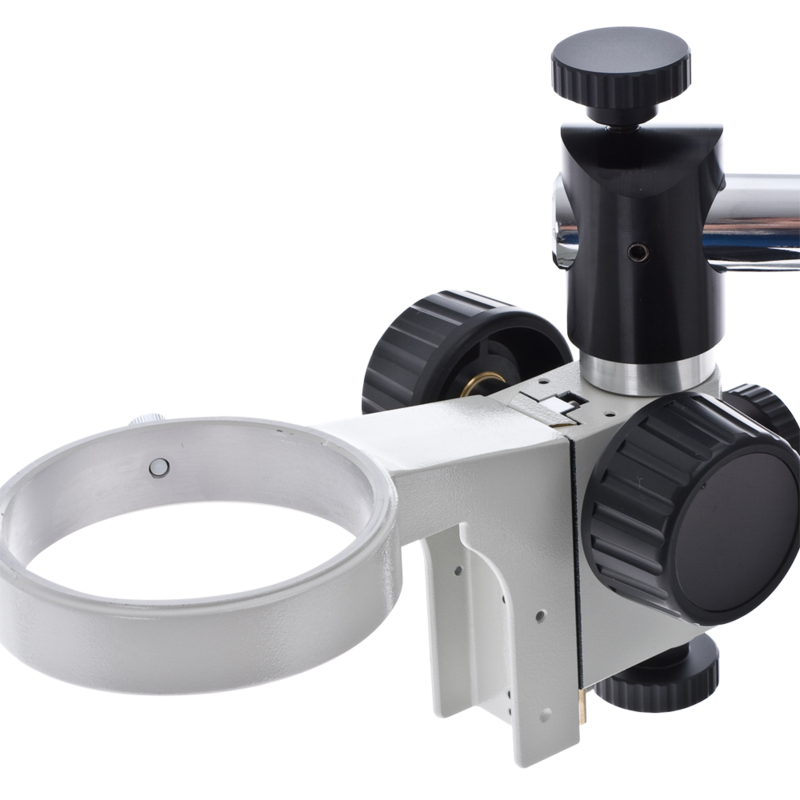 The parfocal zoom range is 7x-45x with dual-sided zoom controls and provides a field of view of 32mm-5.1mm. The working distance is 93mm. 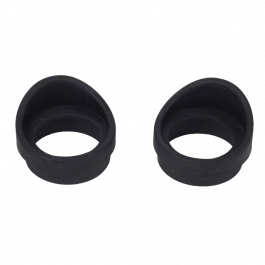 The head is inclined 45° and includes interpupillary adjustment of 54mm-75mm. There are dual +/-5 diopters for convenient individual eye focusing. The head rotates through 360° for flexible viewing positions. 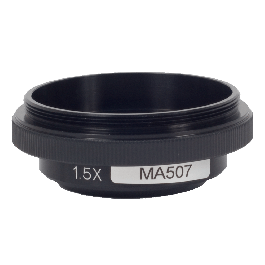 Two sets of wide field eyepieces, the MA502 10X and MA504 20X, are included for maximum versatility. 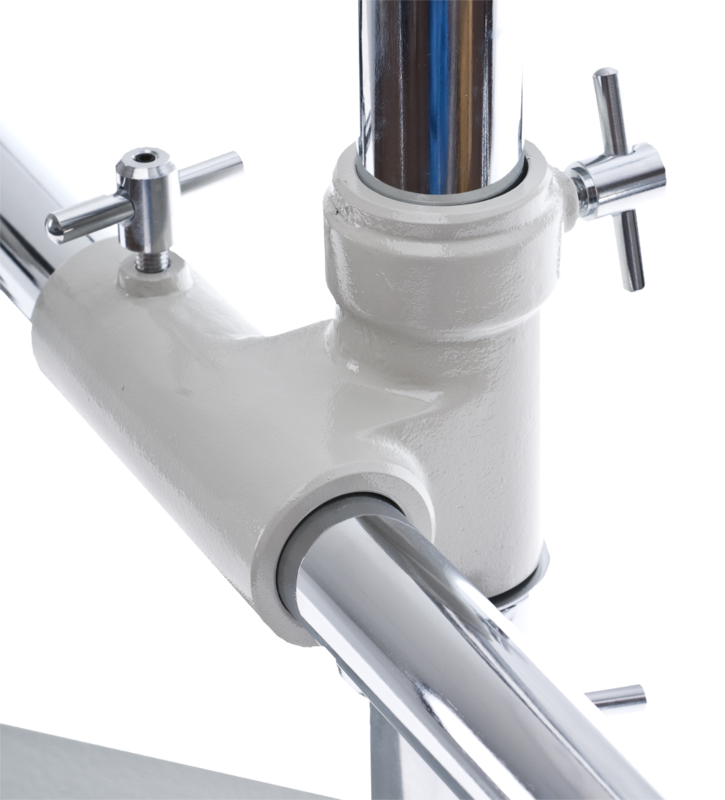 The S-4100 boom stand is solidly built and offers fully adjustable set screws to provide unlimited mounting flexibility. 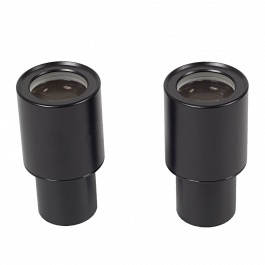 The base platform offers a convenient base for an optional f iber optic illuminator.